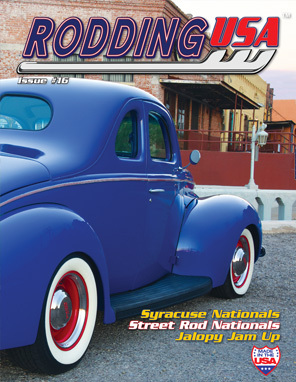 Rodding USA magazine's Issue #16 is in stock and available to order now. Magazines ship next day. Issue#16 features something for everyone with seven top features on traditional hot rods like Wally Jablonski’s 1932 Ford roadster, Darrell Mayabb’s 1948 Thames panel, Gilberto Porras’ 1940 Ford coupe, Rick Steffl’s 1932 Ford roadster, Marv Shetler’s ‘39 Ford convertible and Lynn Houchin’s 1951 Ford tudor. Our Special Features section includes articles on the Warren Fox Collection out of Plains, KS, a tour of the Early Ford Store in San Dimas plus we kick off a new hot rod project: Hot Rod Roadster Pickup – Part 1. Our events coverage for this issue extends to the Syracuse Nationals, the Jalopy Jam Up, the NSRA Street Rod Nationals and the inaugural United Pacific Day in Long Beach, CA. All that plus our regular columns, showcases and our growing dealer network. Rodding USA, by hot rodders, for hot rodders.